Initially unveiled in 2012 as a completely new collection with new models joining in 2014, the Sky-Dweller is the first Rolex equipped with both a dual-time zone and an annual calendar. 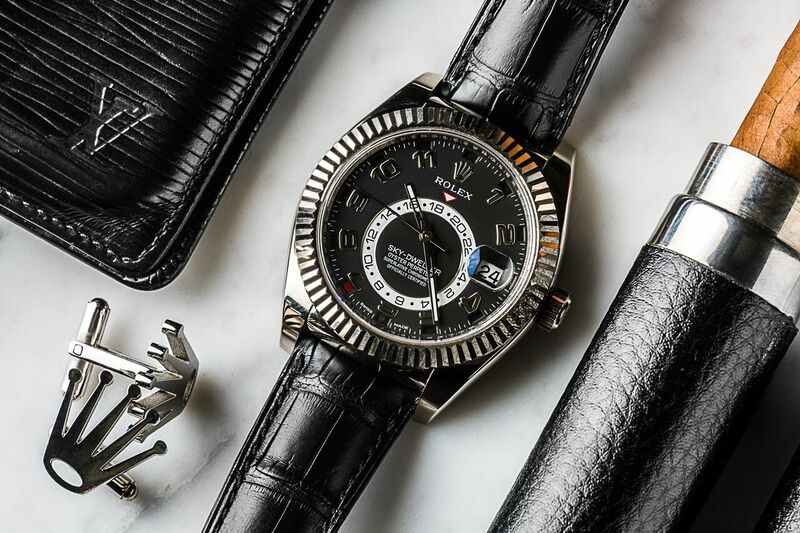 Perfectly suited for the constant globetrotter, the Sky-Dweller allows the wearer to easily keep track of both home and local time, as well and the day and month of the year. The local time is read by the regular center hour, minutes and seconds hands sweeping around the Roman numeral hour-markers and can be changed without affecting the second time zone, date and annual calendar, keeping the timepiece precise at all times. The Rolex Sky-Dweller is capable of many things. The home time, or reference time, is indicated on the off-centered disc with a 24-hour scale marked by a permanent upside-down red triangle. The date is read from the Cyclops-magnified window at 3’clock, whereas the month is indicated with 12 windows placed behind the hour indexes marked by the color red or black depending on the model. Both the date and month are shown in local time. The Sky-Deller bezel is rotatable and it can also be called the Ring-Command. Although technically complicated, Rolex ensured that the Sky-Dweller would be simple to operate. The rotatable bezel, a.k.a. the Ring Command Bezel, interacts with the movement to set the function (local time, home time, day, month) and adjustment is done via twisting the winding crown. 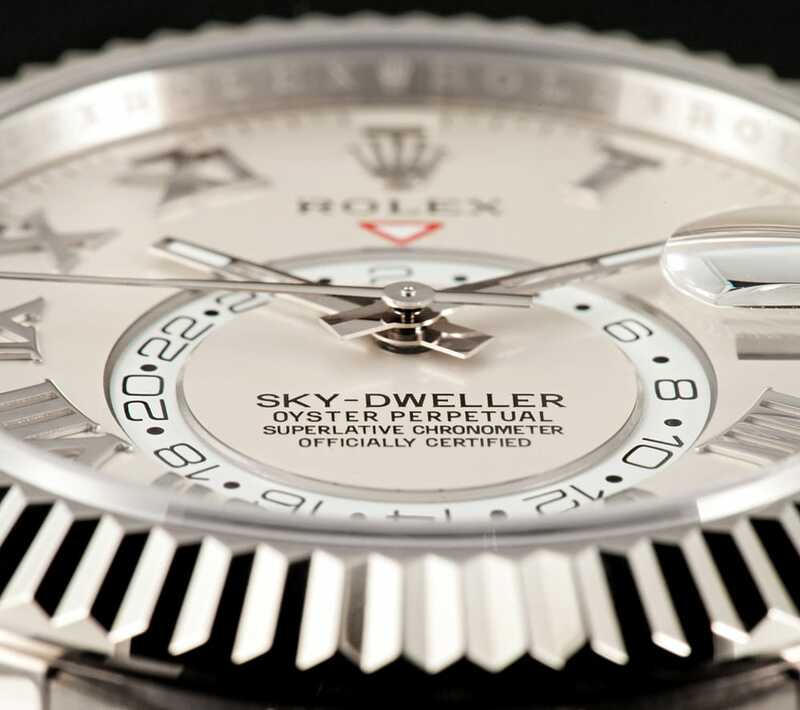 The Sky-Dweller is powered by the Rolex Caliber 9001, a self-winding mechanical movement that is one of the most technically sophisticated calibers built by the brand. The Sky-Dweller’s Saros annual calendar – named after the saros cycle used to predict lunar and solar eclipses – is capable of correctly differentiating between 30-day and 31-day months by way of four extra gear wheels. Its intuitive and elegant design, patented by Rolex, makes the watch very user friendly and is of course, C.O.S.C. certified. There are many variations of the Sky-Dweller. The Rolex Sky-Dweller is an imposing watch with its Oyster case measuring at a robust 42mm and is available in white, black, yellow or Everose 18k gold. Model variants include matching gold Oyster bracelets with the Easylink system or complementary leather straps in either brown or black with a folding Oysterclasp. The Ring Command is also fashioned in 18k gold and the fluting detail adds elegance to the overall look, while the winding crown is equipped with the Twinlock system to ensure waterproofness to a depth of 330 feet. Although the dial boasts plenty of time and date information in a variety of numbers, spaces and windows, it was designed to blend harmoniously for a watch that looks technically striking yet elegantly balanced. A Rolex masterpiece that is both technically and aesthetically distinct from the brand’s other models, the Sky-Dweller achieves a soaring feat.